If you were diagnosed with celiac disease 20 or 30 years ago, you probably had a hard time finding foods that were gluten-free. Gluten is a protein found in wheat, barley, and rye. It also shows up in whole grains related to wheat such as spelt, bulgar, kamut, and triticale (a hybrid of rye and wheat). Some experts on celiac disease also warn their patients to avoid oats. Gluten is the stuff that makes these grains sticky and the reason why wheat flour makes wonderful bread and why it thickens gravy and other foods. It’s literally gluey. Thirty years ago wheat was found in everything. Things have changed for people with celiac disease today. You can’t walk down a grocery store aisle without seeing “gluten-free” labels on foods. Manufacturers put the gluten-free label on some absolutely ridiculous food items just because it’s trendy. You can find “gluten-free” labels on bottled water, ham, chocolate – virtually anything. It’s reasonable to wonder if most consumers even know what “gluten-free” means. The term is in danger of losing its meaning. Some people are sensitive to wheat and other glutens without having celiac disease. It’s estimated that only about 1 percent of Americans have celiac disease. Doctors warn that there are risks in eliminating gluten grains and non-gluten grains from your diet if you don’t need to do so. Many of the non-gluten grains provide a rich source of nutrition. Entirely eliminating these grains from the human diet can lead to nutritional deficiencies. Of course, we address dog foods on this site but trends in human diets often lead to trends in pet foods. 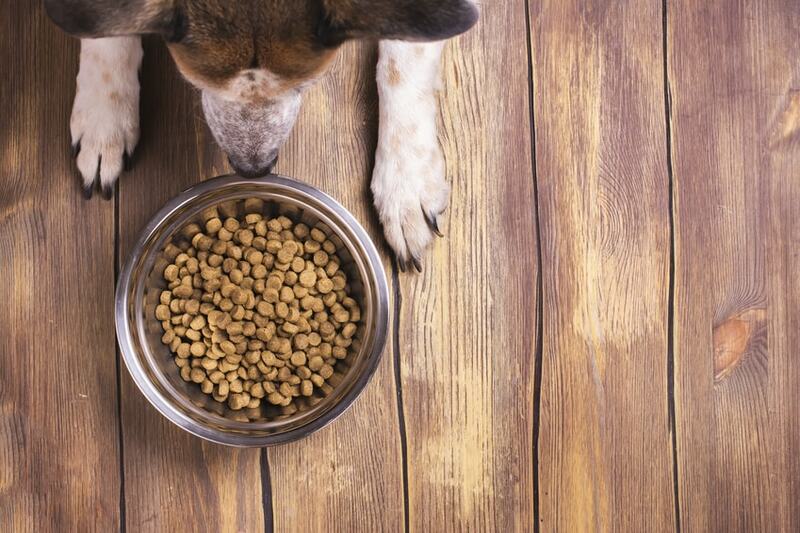 Most people probably weren’t aware of glutens in dog foods until the 2007 pet food recalls when corn gluten and wheat gluten (and rice protein) were tainted with melamine. While corn gluten has been widely (and somewhat unfairly) condemned by pet owners, corn does not actually contain any gluten in the literal sense. It is not one of the grains that contains gluten proteins. The term “gluten,” as applied to corn, is industry jargon and not technically accurate. Some dogs can be allergic to corn or have a food sensitivity to it, but this is also true of beef, chicken, lamb, fish, dairy, chicken eggs, wheat, and soy – all common dog food allergens. Corn is simply another possible allergen and not technically a real gluten. When used in dog foods, it doesn’t produce the same effect as wheat on the gut. Some dogs can have wheat allergies or wheat sensitivities. The Whole Dog Journal has an interesting article about gluten intolerance in dogs which discusses these sensitivities. After being diagnosed with celiac disease, a veterinarian found that he improved after changing to a gluten-free diet. He made the connection to some of his canine patients that suffer from allergies and poor digestion and recommended that they switch to a gluten-free diet with good effects. In fact, he has recommended that all of his canine patients switch to a gluten-free diet, though not all of his clients have done so or see a need to do so. Do dogs get celiac disease? It’s important to point out that dogs do not get celiac disease. This is a human genetic disease. There has been one reported case of a small family of Irish Setters in the early 1990s that appears to have spontaneously developed celiac symptoms. Any other reported symptoms in dogs can be attributed to wheat sensitivity, irritable bowel syndrome or disorder (IBS or IBD), or allergies. There can be health reasons for some dogs to avoid certain grains and glutens, but it’s not necessary – or even desirable – for everyone to choose a gluten-free diet for their dog. Many common ingredients found in dog foods (canned and kibble) are also gluten-free such as lecithin, citric and lactic acids, lactose, arrowroot, cornstarch, buckwheat, guar and xanthum gums, potato starch flour, and potato starch. Other gluten-free ingredients you may find in dog foods include real cheese, plain yogurt, vegetable oils (such as canola), fruits and vegetables, meats and seafoods, potatoes, eggs, beans and legumes. Distilled vinegar is gluten-free but malt vinegar is not. Spices are gluten-free. All forms of wheat, including spelt, triticale (a hybrid of rye and wheat), kamut, durum, farina, einkorn, semolina, matzo/matzah, and couscous. Wheat is often used in dog treats and snacks, too, so check the label. Barley, malt (made from barley), and all kinds of things made from barley such as malt vinegar. Many canned dog foods include wheat gluten as a thickener for gravy. Be sure to read the labels. Flavorings are usually gluten-free but in some instances they can contain wheat or barley. Try to avoid dog foods with added flavorings if possible. Wheat has to be labeled in foods regulated by the FDA. Barley used in flavoring is normally called malt flavoring but it is possible in extremely rare cases for one of these flavorings not to be identified. Modified food starch is gluten free, unless wheat is noted on the label as “modified wheat starch,” “modified starch (wheat),” or if the statement at the end of the ingredient list where it says “Contains” includes wheat. Wheat starch can be used in gluten-free foods if the gluten protein has been removed from the wheat starch by processing. Along with the gluten-free label, this safe wheat starch must note on the label that it has been processed to meet FDA gluten-free standards. Oats are considered gluten-free if they have been specially processed to prevent cross-contamination by other grains that contain glutens. In that case the FDA allows them to be labeled gluten-free. Other oats are not considered safe unless they have the gluten-free label. Caramel color is almost always made from corn. Some dog food companies use caramel color in their foods. This means it would be gluten-free but if your dog has a problem with corn, this could be an issue. Caramel color is occasionally made from malt syrup (barley), which is not gluten-free. Again, we suggest that you avoid dog foods that use added coloring if possible. The FDA has started regulating the use of the term “gluten-free” but we still see the label on all kinds of odd foods. You can see some of the FDA’s thinking on this topic here. Here is the pet food industry’s take on the subject. As far as we can tell, most pet food companies seem to use the term “gluten-free” on web sites and in informal advertising (Facebook, newsletters, e-mails, coupons). From a sampling of dog foods online, we didn’t see any of them that used the term “gluten-free” on their packaging/labels, though the FDA allows them to do so with proper documentation. Whether a company chooses to use this claim on their label or not is voluntary but if they make the claim, they have to follow FDA guidelines. Pet food companies may believe (from past experience) that the FDA takes label claims more seriously than claims made on web sites. If you believe that your dog has a wheat allergy or sensitivity, by all means look for a dog food that says it is gluten-free. In most cases this will be a grain free food since wheat, barley, rye, and their crosses are grains, and glutens come from these particular grains. If your dog has IBD or other sensitive digestive problems, he may also do well with a gluten-free dog food. Otherwise, there is probably no particular reason to feed a gluten-free dog food. “Gluten-free” sounds nice but most dogs don’t require it. Some dogs will do better eating a low grain diet which will contain some glutens than eating a grain free/gluten-free diet. If you feed a food that contains some grain, just make sure that it does not use grains as filler ingredients and that it has plenty of good quality meat protein. There are still lots of very good grain-inclusive premium foods for dogs that do well on them.